Natural light (by constructing a ‘roof-tunnel’ to a Velux) and we love the soft glow it gives to the space. Secondary light such as ‘mood’ lighting is also important. We picked up this great multi-coloured LED lighting which comes with a remote for £18. It’s entirely portable and uses next to zero energy! Our third, and most aesthetically important, was the ceiling lighting. The positioning of the ceiling roses seemed odd so we had an electrician move and re-cord them with a teal-coloured cord in preparation for these amazing lights we came across via Little Greene. Recently launched through a collaboration with Lane and Little Greene, these two-tone colourway lampshades are available in six combinations. As luck would have it one of the combinations was Brighton (pale blue) and Mister David (yellow) which worked with our colour scheme of Juniper (blue) and Mister David, providing a striking cohesive scheme to draw your eye through the hallway. Looking both ways down our hall. 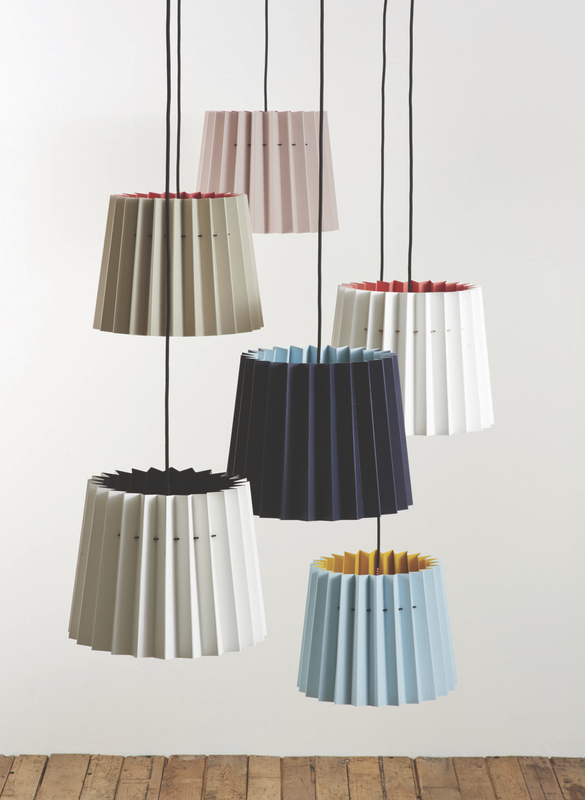 These bold lampshades are colourful and provide a cohesive scheme with lights on and off! The lampshades are screen-printed on the inside and out with contrasting colours from the Little Greene range. Made entirely from thick paper they avoid the unnecessary use of plastics and metals common to most lampshades and the FSC accredited paper is made by one of the oldest mills in the country so you know it’s quality! Proper UK manufacturing can be such a rare thing these days and its a delight to have these bold lampshades pride of place. Lane is creatively directed by designers Joff and Ollie who have a respect both for good design and for the environment. They’ve worked with respected brands that include Paul Smith & Heal’s as well as cultural organisations such as The National Trust & Arts Council England. You may have spotted their work in international design press such as Wallpaper, Guardian Weekend, Living Etc, Elle Decoration, Sunday Times Home and Bright Bazaar to name a few… Suffice to say; these are a duo with a productive drive to put British design and manufacturing back on the map. We caught up with them to find out more about what inspires them and their latest collaboration with Little Greene. What inspires you most about the UK’s graphic heritage? Many things. We really like the London Underground’s attitude to design and the fact that most stations have their own identity. The overall graphic interior aesthetic is great, with tiles and mosaics. Penguin book covers have a brilliantly thorough application of typography and grid. We particularly like the original orange scheme from the 1930s and 40s under Jan Tschichold and the designs from the 1960s and 70s by Italian art director Germano Facetti. L-R London Underground By Design, Penguin Cover, Robin Day Chair & Lucienne Day print. English designers such as Peter Saville, Albert Fletcher and Derek Birdsall are particularly inspiring for us as graphic designers. Royal Festival Hall in London has really interesting graphic detail, as has early Robin Day furniture and Lucienne Day’s pattern-based designs. Although not particularly graphic, we’re huge fans of John and Sylvia Reid’s furniture company Stag from the 1960s. We also have huge admiration for British manufactures such as Ercol, a British company who are internationally recognised as brilliant furniture makers. It’s quite a list! What do you enjoy about the process of collaboration and why did you choose to collaborate with Little Greene on the creation of these lampshades? You become a better designer through collaboration. The opportunity to learn through other people’s knowledge and expertise creates a dialogue that allows creative development for the product. With Little Greene, it was the shared understanding of colour. It was really nice to create a product to be matched with another (their range of paint). Also, they are an all British manufacturer like us which is something we admire. David Mottershead, MD at Little Greene concurred that this had been a collaboration between companies aligned in their commitment to British design and manufacturing: ‘Great British designers are world renowned and this was a collaboration between friends. We had differing ideas about colour combinations; however, once we laid out the colours the most beautiful ones came forward. My personal favourite is the Sepentine and Orange Aurora with the fabulous surprise of coral hidden inside the cool exterior of grey’. Talk us through the process of creating these lampshades from concept, screen printing, folding, threading etc. How did you source craftspeople, choose colourways and what drove the eco-credentials of this piece? For each lampshade we worked with Little Greene’s head designer to select two colours to match their wall paint trends but which also highlight and contrast with each other. The screen printing colours were then hand mixed to match the specific paint colour – it was a very detailed process. The flat paper sheets are hand screen printed, die cut and then hand assembled. These two-tone lampshades throw out tons of colour and light. We love the jutting zigzag shape, scale and dual upwards-downwards glow! The eco-credentials of the lampshade are realised through the ecological developments in the lighting technology. We have created product out of one material – normally lampshades are pieces of wire and plastic stuck together that you cannot recycle. Looking up at the lampshade from below at night is really special. Punchy bright lines and warm light greet you. It almost looks like a sunflower and there are no plastic ‘bits’ to be seen. What designers do you rate for producing really innovative beautiful design right now? The furniture designer Terence Woodgate for his pure and simple designs, nice proportions and uncomplicated-ness! Tom Dixon for his interesting uses of materials and processes. When we were at London Design Week last year we spotted a sofa by Swedish furniture company Cate and Nelson, which we really, really wanted! You’ve obviously got high production values and detail at the heart of your designs but how does this commitment to quality and the environment actually influence your development? A nicely detailed and well made product is the difference between good design and average design. We try to monitor this as closely as possible at all stages! Our concept was to make a lampshade using one material with minimal process that is structurally interesting. We wanted to create a graphic, contemporary re-interpretation of a classic concertina-style lampshade. 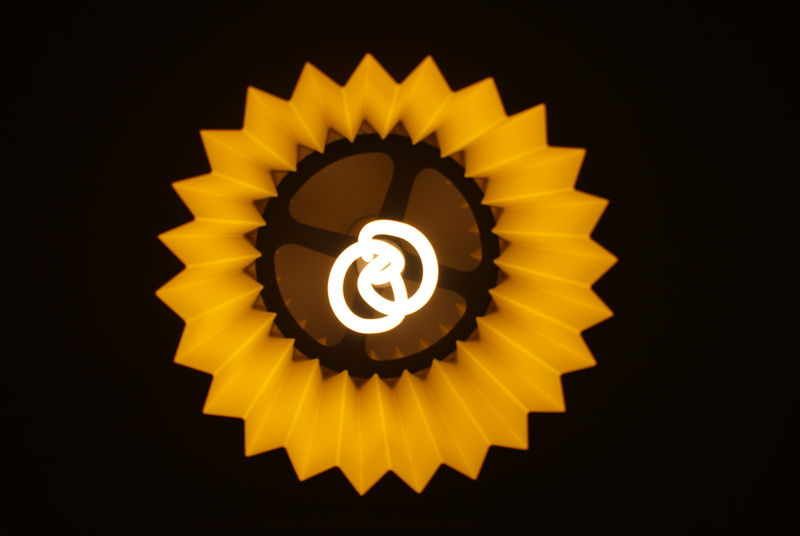 And with the Twin Tone Lampshade we feel like we’ve achieve this… We hope! Follow this exciting duo via Twitter, Facebook, Instagram or Pinterest. You can also purchase their work via a number of online worldwide stockists or in store – see here for the little black book! Previous article Little Greene | Transform your experience of a space!